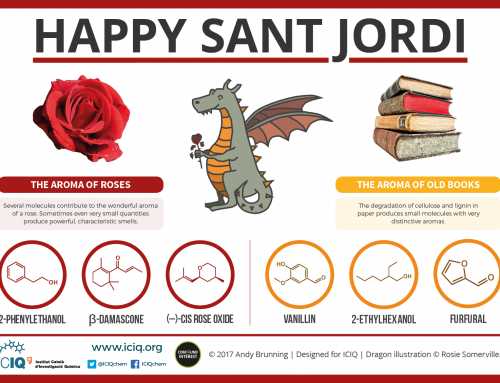 This graphic comes off the back of a number of requests for it to be added to the ‘Aroma Chemistry’ series. 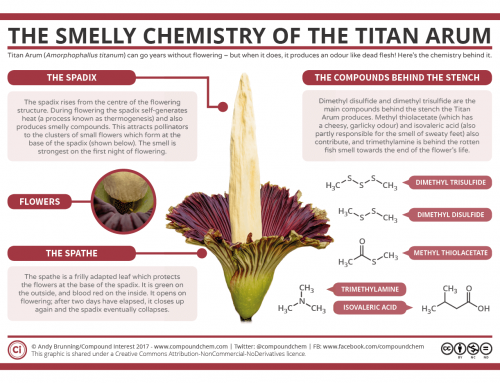 The characteristic ‘new car smell’, as with the majority of entries in this series, can’t be pinned down to just one compound – rather, it’s a complex mixture of chemicals that, combined, give the recognisable smell. 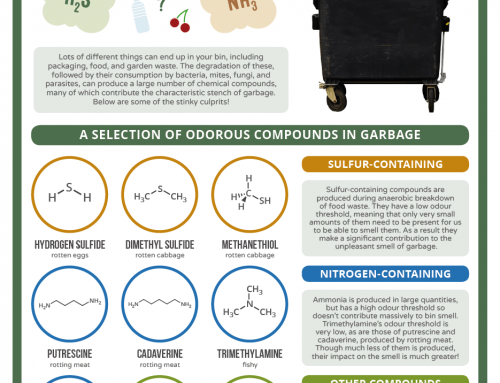 Here’s a look at some of the major compounds, and where they come from. Several studies have been carried out on ‘new car smell’, and a large number of volatile organic compounds (VOCs) have been detected during this research. The estimated number of compounds varies wildly: several studies quote in the region of 50-60 volatile organic compounds, with one or two even venturing well over 100. But where do these compounds come from? The majority of the compounds originate from the various parts of the new car. Chemicals used to make carpets, upholstery, plastics and adhesives used in the car can all contribute to the VOCs present via a process known as ‘off-gassing’, by which they release fumes into the atmosphere. The precise compounds will depend on the materials used in manufacture, and so will vary in different brands of car. 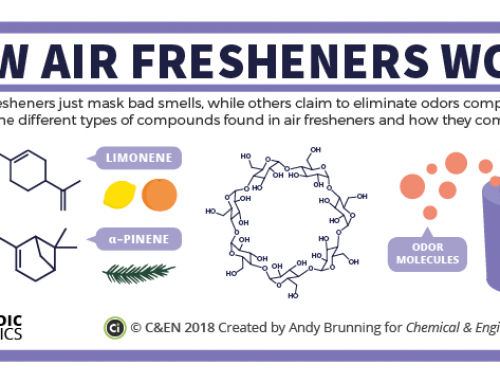 Additionally, some of these compounds may be odourless, but a large number may contribute in some way to the ‘new car smell’. 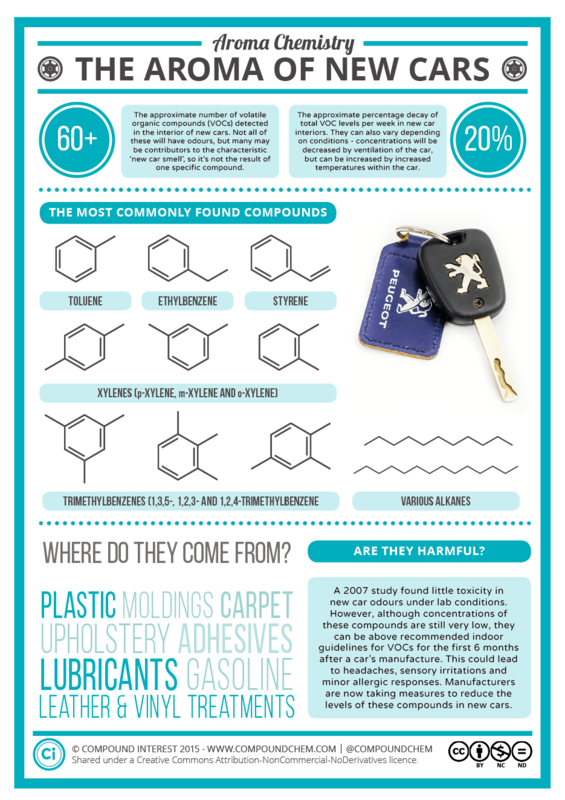 Studies have isolated some of the most common VOCs found in the interiors of new cars. 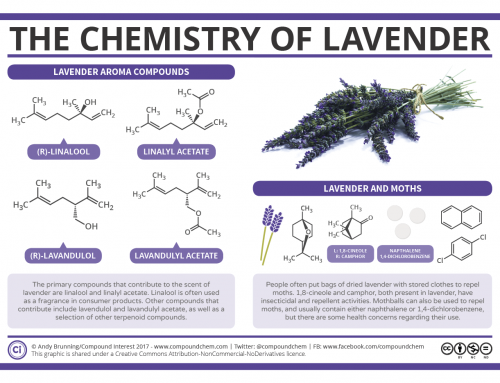 Many of these are aromatic compounds – that is, compounds containing a benzene ring, a structure based on six carbons bonded together cyclically. These include toluene, xylenes, styrene, and trimethylbenzenes. 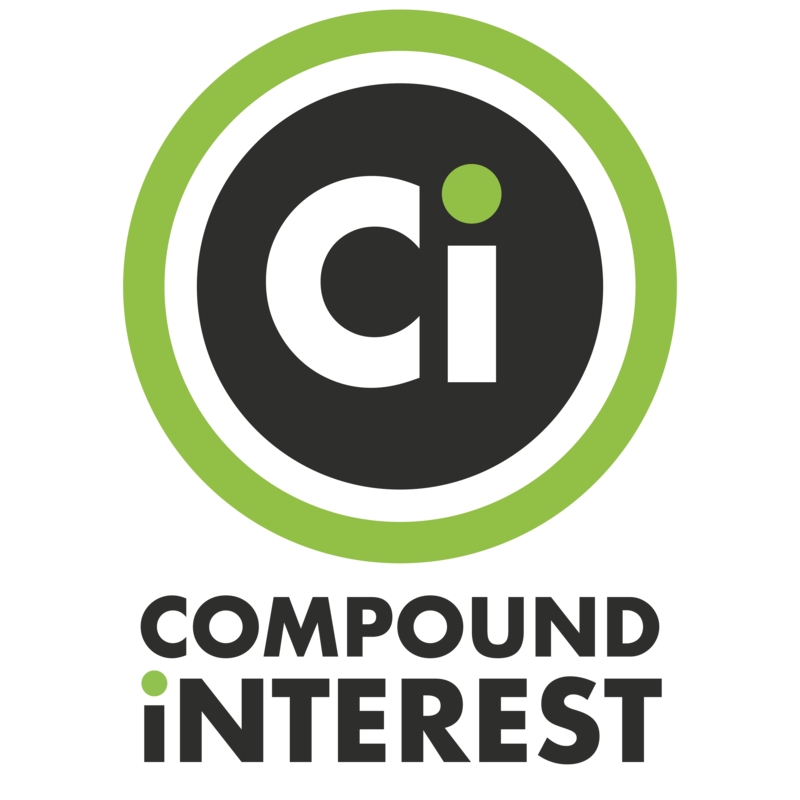 Additionally, simpler carbon-based compounds are also found – these include alkanes, which are composed simply of long chains of carbon atoms, bonded to hydrogen atoms. The output of these VOCs isn’t constant – in fact, researchers found that their emission decreased from the manufacture of the car by around 20% per week. They also found that conditions in the car could affect their concentrations. Obviously, ventilating the car, via air conditioning, or simply opening a window, can act to decrease their concentrations. Conversely, an increase in temperature in the car’s interior can lead to an increase in their concentrations. Some of the compounds found as VOCs within the interior of new cars can be toxic in higher concentrations, so should we be concerned about the toxicity of new car smell? 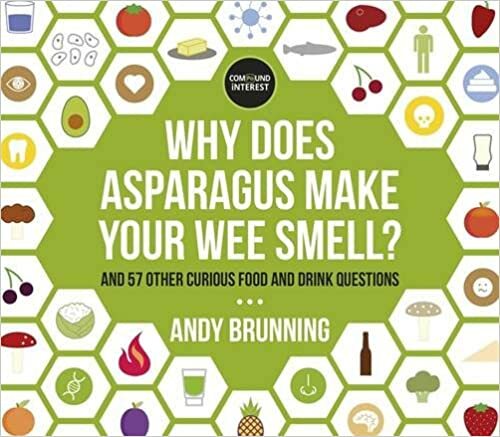 Unfortunately, there’s still not really a definitive answer. What’s definite is that the concentration of VOCs in the interior of brand new cars is above the recommended maximum VOC levels for indoor spaces, when there is no ventilation. However, the concentration of these VOCs decreases quickly with time, so that 6 months after a car’s manufacture, the levels are below the recommended maximum VOC levels. Studies are conflicting as to whether these compounds are harmful to human health at the levels present. A 2007 study concluded that there is ‘no apparent health hazard’. It is worth noting that this study seems to be primarily considering immediate toxicity of the compounds, rather than any potential longer term effects. Other studies, albeit ones that were not published in peer-reviewed journals, have been more ambiguous in their conclusions. In summation, however, the worst noted effects are headaches, drowsiness and mild allergic responses – and these can be minimised by ensuring adequate ventilation in very new cars. Even if you sit in your brand new car hyperventilating, you’re not going to experience anything worse than this. Car manufacturers are now also actively working to reduce VOC concentrations in new car interiors.